May is the perfect time to consider adding a lovely selection of pots, tubs and planters to your outdoor space. Enjoy a delicious dose of sunshine and fill your planters with an array of pretty plants for you and your garden visitors to enjoy this summer. Tubs and pots are so easy to maintain and require minimal care once they have been created. Being self-contained will ensure your pots and containers remain pretty much weed free. Planters and pots can be used in many different outdoor spaces from balconies, steps and decking to driveways and patios. Pots are portable, and you are therefore not limited to where you position them in your outdoor space. Use a pot trolley underneath your container if you are going to be moving them around, it does make the task so much easier. Just like rearranging your indoor living space, moving planters to different areas of a garden or courtyard can create a new summer scene of enjoyment. To ensure longevity of your containers it is also essential that the plants are watered regularly and it is a good idea to feed them every ten days through the summer with a good quality plant food such as Tomorite. Pots and containers are an ideal choice for anyone working on a budget; you really don’t need to spend a fortune to enjoy a stunning show of colourful blooms. Here are some plant ideas for your very first container. Pots and planters are available in a variety of size, styles and finishes. If you are feeling particularly creative, you can even paint a terracotta pot to design a container that matches your outdoor colour scheme; this is also a lovely idea to enjoy with the children over the May half term holidays. A great way to encourage your children to leave the iPad indoors and enjoy some creative garden time and lovely fresh air. All you need is some Acrylic craft paints in assorted colours, a can of Clear Acrylic spray and a colourful and creative imagination. We have an extensive selection of terracotta pots in a variety of shapes and sizes and they look even more attractive sitting on a matching saucer. These particular pots feature a drainage hole in the base to ensure they do not become waterlogged. To stop the potting media being washed out of the pot, place some drainage material such as stones or broken terracotta (crocks) to cover the whole. Pots also make a wonderfully thoughtful gift for friends and loved ones during the summer months. Why not consider designing your very own colourful creation as a gift, this is an adorable idea as you can choose the recipients favourite colours and flowers. A flower pot will last all summer unlike a bouquet of flowers that are always over far too quickly. 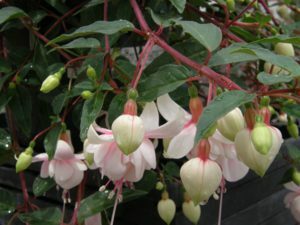 Depending on the size of your pot or planter, there really is no limit to what you can plant in them, they are perfect for flowers, shrubs, ornamental Bay or Box trees, herbs and even vegetable growing. Towards the end of May, once the threat of frost has passed, pots look lovely when filled with a mixture of summer plants. 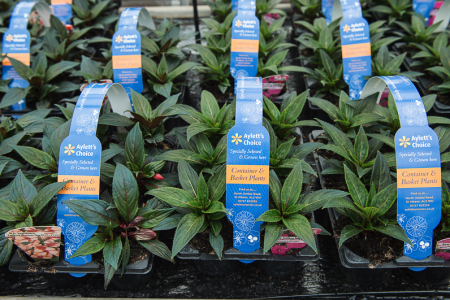 Either make your own selection or pick up one of our Aylett’s choice bedding packs, each one with a recipe of plants that is sure to inspire. Choose some upright plants from our homegrown Geraniums, Fuchsia or Begonias as the central focus and then a mixture of trailing Fuchsia and Geraniums and container plants such as lobelia, bacopa, nemesia, verbena, and trailing petunias to go around the edge. Remember to stock up on your garden tools this season. We have a vast selection of light weight trowels that are suitable for tub planting. We also have a lovely collection of garden tools for children, to capture their imagination and help them learn how much fun gardening can be. If you are unsure what would work in your garden space our friendly team are readily available to offer you advice on the best pots and tubs to suit your needs, and help you select the right plants to grow in them. Don’t forget to follow our Instagram account @aylettnurseries to keep up to date with all our visual wonders.